» home » magazine » 2008 » february 2008 » looking to transfer? A through-the-window transfer system such as this typically finds use on large-window presses and handles wide stampings. 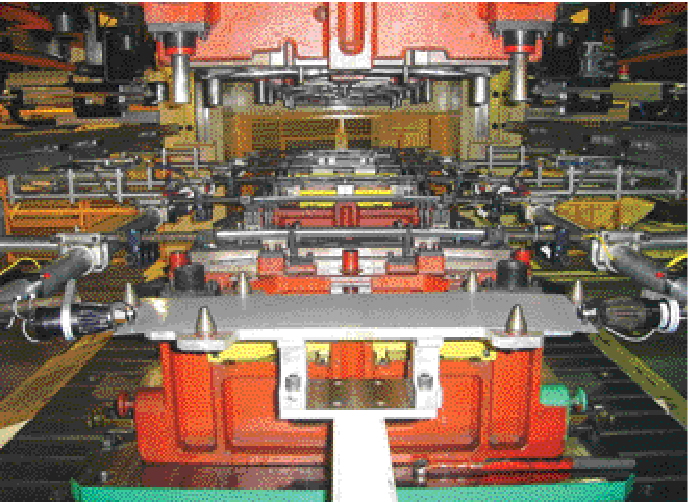 Because transfer rails reside outside of the bolster though within the wide press window, die removal is simplified. With increased global competition comes increased pressure for metalformers to obtain more output from production machinery with less capital outlay. Automation certainly holds the key to increased press productivity, but it must be the right automation. A press incorrectly equipped with automation to handle part loading and transfer can hamper the success of an investment. If a press and a forming process can achieve a certain level of output, every effort should be made to ensure that the automation does not become a limiting factor on a given line. This is especially true in regard to transfer automation. Once a stamper decides to enter the transfer market, it must source the necessary equipment. In certain cases part volumes alone will justify a new press. In others the stamper may look to retrofit an existing press to convert it into a transfer press. Here’s what to consider when exploring your transfer-automation options. In deciding the style of transfer to integrate, press-window size is critical. Through-the-window transfer systems usually are found on newer presses or on dedicated transfer presses with large windows, rolling bolsters and quick-die-change (QDC) capabilities. Here, windows are larger than the bolster, allowing transfer rails to reside outside of the bolster area. 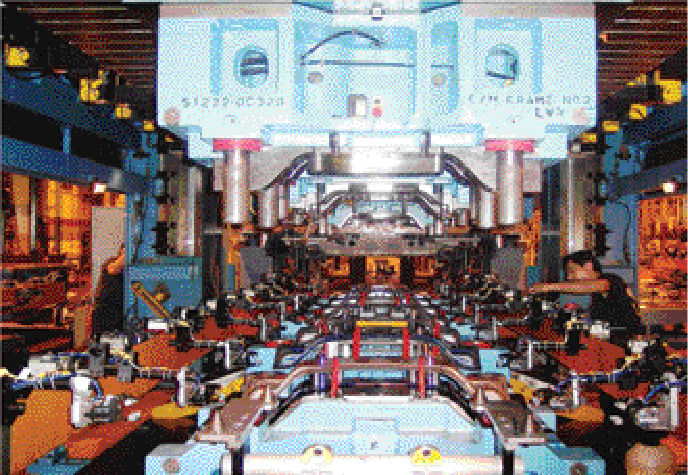 This permits the system to handle wide stampings and allows for simplified die removal during changeover. Front-and-rear-style transfers fit presses with smaller windows or no windows, making these systems popular within the Tier One and Two stampers. For example, with a front-and-rear transfer, a press with a 72-in.-wide window can process 72-in-wide blanks or coils. Conversely, a through-the-window system would limit blank and coil widths, as room is needed within the press to accommodate transfer rails, clamp stroke and finger tooling. Here, maximum part width likely would range from 32 to 40 in. 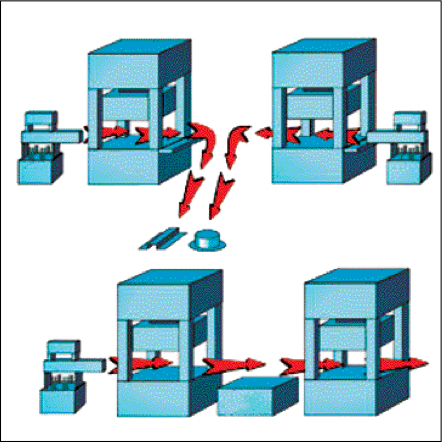 In side-by-side multiple-press systems, presses can run individually (top) or as a single large transfer press (bottom) with the addition of an intermediate shuttle stage. Today’s transfer systems can be adapted to almost any type of press—mechanical, hydraulic or servo, whether link or eccentric-gear driven, and in capacities from 300 to 3000 tons. Ask yourself what you want to achieve with this press today and in the future. Do you want to run progressive and transfer dies? If so, consider front-and-rear transfer systems, where the transfer can be parked up and out of the , allowing the press to operate in manual mode or with a progressive die. Do you want this press dedicated to transfer work only? If yes, consider some trends. As most automotive OEMs have a mandate to build vehicles with fewer components in every new model, parts will become more complex, meaning more die stations and entailing higher stamping tonnage and larger bolsters. Also, more and more stampers use side-by-side multiple-press systems. Each press can run individually or, when extra tooling stations are required, the system can operate as single, large transfer press by initiating a intermediate stage between the presses and running them in a continuous, synchronized operation. The point is, you are buying a press and transfer automation not just for today’s jobs, but for tomorrow’s. Many stampers err by opting for a press with insufficient stroke, thus lacking enough crank angle to allow proper transfer-system movement. Use a 4:1 ratio when specifying a press for transfer work. For example, if a part requires 6 in. of working stroke, acquire a press with a 24-in. stroke. Typically, a running specification uses the worst-case scenario to determine whether enough press stroke is available to run at speeds to meet production requirements. If a stamper and die source provide the total part payload and transfer-motion profile (pitch, lift and clamp), as well as how many degrees of free press angle, a transfer-system provider can calculate the maximum speed at which the system can operate. Note that with link-motion press gearing, a transfer system has even less time to achieve its movement than with more standard press drives. Front-and-rear transfer systems like this one are ideal for smaller-window presses, because transfer components reside outside of the press. This allows acceptance of coil as wide as the press window. Today’s production stampers run a greater variety of parts in smaller lots than ever before. Many contract stampers run automotive and appliance parts in the same press and with the same automation. This fact makes QDC considerations critical to the success of a transfer operation. Factors such as tooling design, the application of automatic die clamps and rolling bolsters, and docking of transfer bars all impact the length of last-hit-to-first-hit timeframes. All of these elements add a one-time cost to the investment in a transfer system, but return is seen with shorter changeovers, less human set-up errors and reduced equipment damage caused by repeated-handling requirements.Transfer-bar design is critical when assessing changeover time. Individual transfer-bar finger adjustments, if required as a function of changeover and job setup, cause ongoing delays and errors. Solutions include modular transfer-bar assemblies—tuned for a given part and left intact—and dual rolling bolsters, which allow for prestaging of the idle bolster while production runs on the other bolster. When structured correctly, a die-change process should take no longer than 15 min. from last hit to first hit. The best operations accomplish these changeovers regularly in 5 min. Using finger tooling—and planning ahead of time to minimize costs—can greatly benefit your operation. Critical-path planning and project-management timelines influence most transfer projects by causing them to be scheduled on the basis of lead time. The long lead-time items, such as the press, transfer system, and die design and die build, originate early in a project’s life. Shorter lead-time items such as finger tooling usually are addressed long after die design is well under or completed. Planning for finger tooling so late in the process can require a die redesign, causing several problems: Designers may be reluctant to make changes; the redesign could exceed time and funds budgeted for the project; and critical die tryouts or pilot production runs may have to be canceled due to time constraints. To prevent a die redesign and ensure top transfer-system performance, the tooling supplier should meet with the die designer at the beginning of a project. Working together as a team, they can generate many no-cost ideas to increase system speed. An increase of just a few strokes per minute can substantially increase profitability and return on investment. A meeting with the customer, die designer and tooling supplier should include a discussion of press type, transfer type, part weight and size, process sequence, part gripping at each station, method of loading the first die, and changeover frequency (see Proper Transfer-Die Design sidebar). Blank destackers at one time were one-off custom machines, developed to accommodate a specific blank configuration or material. Pressures from industry drove the need for flexible, competitively priced destackers capable of high production rates. Scrap costs, and the differing materials required, can quickly justify the need for a blank destacker. Destackers should be able to handle a generous size range, and accommodate developed and sheared blanks. 1) Press specifications—tonnage, bed size, strokes per minute (fixed or variable), stroke length, shut height, type of drive, scrap opening locations, size of windows. 2) Transfer specifications—make, type of drive (servo or mechanical), pitch length (minimum and maximum), clamp length (minimum and maximum), lift height (minimum and maximum), speed or control limitations, weight of bar and fingers (if available), length of part life in years. 3) Part specifications—material, thickness, complete data on part shape, tolerances, volume required per hour/day/month. 4) Miscellaneous information—quick-die-change system with description, frequency of changeover, feed method (coil or blank) and feed method’s accuracy, drop-off or finished part, lubrication specifications and amount, critical finish areas. 5) Sample parts or sight model. Guide-pin or heel-block locations. Traditional die-design principles suggest that pins or heel blocks be located as far outboard as possible (Fig. 1). This allows for the longest lever arm between the contact points, keeping the upper die parallel with the lower die during operation. This works well with progressive dies, which contain all motion inside the die, or with line dies, which allow the operator to work between the die pins. But with most transfer systems, this front-to-back location results in a longer clamp stroke—due to a finger return path located outside of the pins—and a slower transfer speed. Left-to-right pin locations usually are dictated by part and die size. 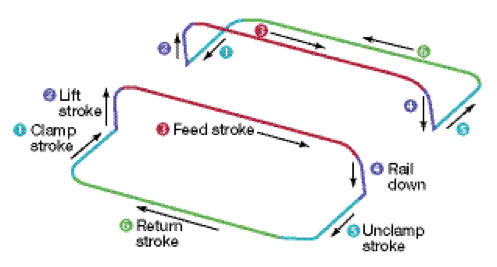 Efforts typically are made to orient the part with its minimum dimension in the left-to-right direction (direction of flow) to obtain the required number of stations in the press and to maintain a minimal stroke distance. For a large press producing small parts, the dies may have to be oriented close together in the center of the press—with the loading system if feasible—or idle stations may need to be added to keep the stroke short. Guide-pin and heel-block heights. Guide pins or heel-block posts should reside in the upper die shoe, with bushings or heel blocks located in the lower shoe. However, bushing and heel-block heights, as well as guide-pin lengths, often are ignored. While not a problem with progressive or line dies, a transfer die requires short pins and heel blocks so that transfer fingers can move as soon as the die begins to open. Long pins or heel blocks force the system to wait longer for a clear path, providing less overall time for the transfer operation. When the fingers must move faster, part control often is lost; or if the press is slowed, productivity suffers. If pins or heel blocks are shorter on the top die and taller on the bottom die, and the engagement point resides near the passline of the transfer, the clear path occurs earlier. This allows more time for transfer motion, resulting in faster press operation. Stop-block locations and heights similarly should be considered in transfer-die design. Lower die profile. Rather than run the movement of the transfer with square corners at the transition of lift motion and stroke motion, most servo transfers can round the corner—essentially overlapping between the two motions. This is possible where no interference exists between the fingers or the lower surface of the part and the lower die. More clearance allows greater overlap, creating a larger radius and making transition from lift to stroke smoother and faster, increasing output. Part location. Parts must be located accurately when transferred to a new station. When transfer fingers release the part, correct location must be maintained in all axes, including the rotational axis. Finger return path. 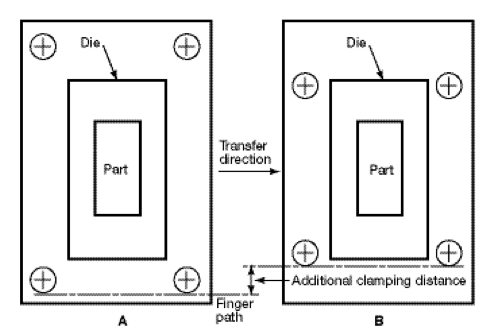 Critical for transfer-die design, clearance between fingers and die components during the return stroke of the transfer must be analyzed to ensure no interference. Clearance issues for mechanical transfers are even more critical, as servo transfer systems can vary the return profile of the fingers, allowing more clearance possibilities. All of these suggestions save time by reducing travel distance of the fingers, beginning transfer motion early in the cycle, or rounding the corners of various motions (Fig. 2). At a fixed press speed, these improvements slow finger motion and reduce the chance that part control will be lost.